The internal combustion engine was developed in the latter part of the eighteenth century, as the result of collaborations between several different scientists. Unlike the steam engine, which was the invention that began the Industrial Revolution, the internal combustion engine does not require an external heat source, instead, it uses heat to combust fuel as part of the flow circuit. Although the internal combustion engine did not truly supersede the steam engine until well into the nineteenth century, once it did, it began a revolution in transport. By 1876 the modern internal combustion engine was commercially available – designed by Nikolaus Otto, although heavily influenced by the work of Etienne Lenoir. It was this invention that allowed for the development of personal transport – most notably in the form of the car. Later inventions such as the airplane also used a two- or four-stroke engine. the continuous combustion engine, as used by jet and rocket engines. Furthermore, with the increasing move towards hybrid or electric cars, the engine is an ever-changing technology. However, most cars across the world still use gasoline or other petroleum products as the fuel with which to create the combustion. The most common engine type in the world is the gasoline engine, as used in most privately-owned vehicles. Indeed, with the growing numbers of cars sold in the developing world, there are ever-more gasoline engines globally. The gasoline engine functions by burning a mixture of gasoline and the air it takes in from outside. The combustion takes place in a metal cylinder, into which a cylinder slides and retreats. The movement of the piston reduces the available volume in the cylinder for gases, which is essential for the function of the engine. It is the change in pressure, driven by the piston and then by the expanding of the gases, that is what drives the engine. The diagram below shows a cross-section of an internal combustion engine. A four-stroke engine will contain four of these sections, with pistons all offset from one another to ensure constant motion. In effect, the function of an internal combustion engine is to convert heat into work – or to put it another way to convert chemical energy into kinetic energy. the piston down and out of the cylinder. The opening of a valve at the fuel and air inlet introduces both air and gasoline into the cylinder. The movement of the piston is known as the intake stroke or the induction stroke. The next stage is the compression stroke. Here the piston is driven back into the cylinder, compressing the space available for the fuel and air mixture. The piston forms a perfect seal with the cylinder, thus increasing the pressure in the space containing the fuel and the air. Once the piston is fully inserted into the cylinder, and the space is as reduced as possible, the spark plug creates a spark to ignite the mixture. Once the fuel is ignited, the fuel and air mixture creates a large amount of heat in a short amount of time. This effectively functions in the same way as an explosion, as the resultant pressure causes the piston to powerfully move out of the cylinder. This is what causes the power produced by the engine. In addition, the release of the piston turns the crankshaft, thus inserting the next piston along, and so on. the cylinder and out of the car’s exhaust pipe. The power stroke produced by one of the cylinders powers the other cylinders that are not going through the power stroke. As the pistons are driven out, they turn the crankshaft in the vehicle, which transmits torque. The role of the crankshaft is to turn linear motion into rotational motion. A crankshaft is a rod with undulating, offset sections called throws. These throws are connected with the pistons in such a way that the upward and downward motion of their movement will rotate the crankshaft. This is what gives the vehicle thrust (forward momentum) and what allows it to drive on the road. Naturally, because of the multiple steps in this process, a problem with any one individually will cause the car to stop working. Thus, the entire engine must work in a sequential system. 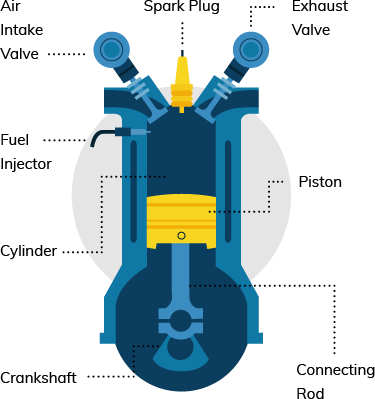 In a four-stroke engine, each of the cylinders is at one of the four stages at any given time – hence why the engine is continually moving forward. is used to power a compressor before the air intake. This greatly increases the overall efficiency of the engine by forcing the exhaust gases to complete one further task and one that helps with the intake of gases at the beginning of the process. This compression means that the engine doesn’t have to work as hard, and can, therefore, run more efficiently. In Europe, 54.9% of registered cars are diesel, compared with only 3% in the United States. Partially, this is due to the relative cost of gasoline for the consumer in both countries. In Europe, where gasoline is relatively heavily taxed, diesel becomes proportionally more expensive. In the United States, where gas prices are lower, diesel prices can be prohibitive. Diesel engines function in a slightly different way to gasoline engines. In recent years, there has been a changing perception around the use of diesel. Previously, diesel engines were assumed to be dirtier than gasoline engines. However, developments in diesel engines have made them more efficient, and in some larger vehicles (such as buses or ships) diesel is the fuel of choice because of its relative efficiency. In gasoline engines, the air and fuel are mixed in advance of entering the cylinder. This makes compression more difficult. By contrast, a diesel engine compresses only the air, making the compression ratio much higher (i.e. it is easier to compress the volume of the cylinder using the piston). This means that they are more efficient. For example, the average thermodynamic efficiency of a diesel engine is around 45%, whereas a gasoline engine operates around 30% efficiency. Diesel as a fuel also contains 11% more energy than an equivalent amount of gasoline, thus meaning that it is at an advantage when it comes to its use as a fuel. Indeed, such is the relative power produced by a diesel engine that crankshafts have to be cast from single pieces of metal so as to avoid breaking under the strain of a piston’s movement. As a result of this greater efficiency, diesel engines are able to produce more torque for longer, meaning that vehicles that deal with heavy loads are often more suited to a diesel engine. Diesel engines also don’t require an ignition system, meaning that there are fewer parts to break down. This means that, for long-distance trucks, or buses, the ability of a diesel engine to produce more power, as well as generally being robust, makes it superior to a gasoline engine. Electric and hybrid vehicles both work on the same core principle of gasoline engines – namely that they convert chemical power into kinetic energy. In electric and hybrid vehicles, however, the input is not fossil fuels, but electricity. In some cases, there are some gasoline elements. In general, however, technology is improving with regards to non-fossil fuel cells, meaning that hybrid cars are being replaced by all-electric vehicles. Regardless of the specific fuel used, there are two potential systems in use – parallel and series. In a parallel system, the electric motor and the gasoline engine are two separate systems, working in parallel with one another. Parallel systems are therefore hybrid since they rely on the presence of both a gasoline engine alongside an electric battery. As a result of their parallel status, they require a smaller battery pack than is the case in series engines. One advantage that parallel systems have is that the gasoline engine can function as a generator to charge the battery when the demand for power is low. In parallel systems, the engine connects directly with the wheels. This is a more efficient system than in other configurations, meaning that hybrids with parallel systems are often the lowest-cost vehicles on the market to run. Hybrid vehicles benefitted from a number of advances in battery technology in the 1980s and 1990s that made them viable for use in cars, but not yet capable of powering a car without an additional gasoline engine. However, with these developments, parallel systems are in danger of being rendered obsolete by series systems, which have the advantage of having fewer intermediate stages, and benefit from ever-improving technology batteries – in terms of both power and storage. A series system is the simplest form of engine setup. In these, power comes exclusively from the electric motor. In hybrid cars, the motor may receive electric power from a gasoline engine (which basically functions as a generator). In electric cars, the electric power comes from battery packs. The flow of energy is determined by a computer. In a series system, the use of regenerative braking recharges the battery pack; this means that when the driver takes his or her foot off the accelerator pedal, the car will use friction to recharge the battery, thus conserving energy. The model above shows a hybrid series system, where the gasoline provides the initial fuel cell. However, in cars such as the Tesla Model S (i.e. a non-hybrid electric vehicle) the entirety of the series consists of the final three stages (from battery to transmission). As battery technology develops – which was previously what limited this technology – costs have dropped and efficiency has increased. This means that electric vehicles are becoming ever more viable. Ultimately, the internal combustion engine is one of humanity’s most important inventions. The internal combustion engine democratized travel, allowing individual citizens to have access to personal means of transport. However, as there has been a greater understanding of the way that greenhouses gases affect the environment, there is a growing understanding that the byproducts of the internal combustion engine have a deleterious global impact. As a result, the shift toward hybrid and fully electric vehicles has the capacity to allow for cars (and personal transport in general) to remain a viable means of transport in the twenty-first century. The internal combustion engine has its origins in the same decade as the French Revolution. It is truly remarkable that the same principles still drive cars to this day. Indeed, the importance of the internal combustion engine cannot be overstated, and, with the development of green engines, it is likely that the internal combustion engine will continue to be a feature of transport for the foreseeable future.